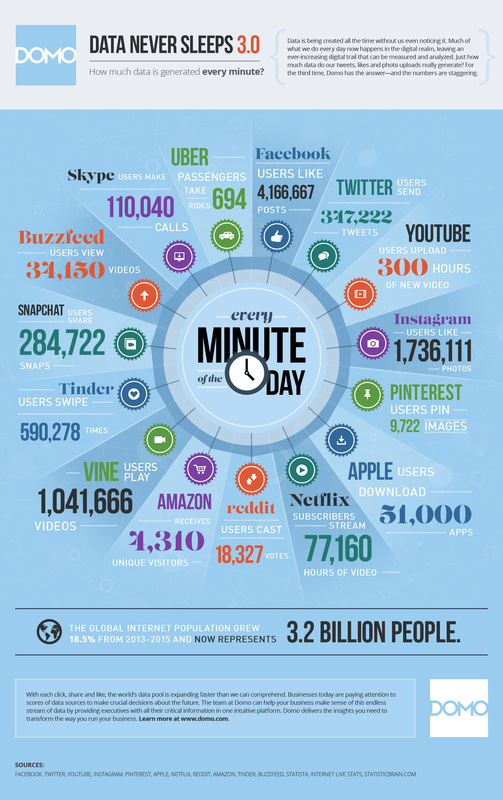 How Much Data Is Generated Every Minute On Social Media? Have you ever wondered how many Likes are made on Facebook or Instagram posts, or how many Tweets are sent out every minute? As you would probably guess, the numbers should be rather astounding! There is a great amount of data generated from those social activities every minute, which of course has to be stored somewhere. This infographic from Domo gives us a good idea of the actions that are creating huge amounts of data out there. Facebook, the most active of social networks, with over 1.4 billion active monthly users, generates the most amount of social data – users like over 4 million posts every minute – 4,166,667 to be exact, which adds up to 250 million posts per hour! Instagram, with 300 million monthly users in 2015, comes in second with 1,736,111 likes on photos each minute of the day, amounting to over 100 million likes per hour. #Facebook users like over 4 million posts a minute! #Instagram users generate 1,7 million likes. In third place, Vine – which doesn’t belong to Facebook‘s “empire” – still generates extraordinary amounts of social data, with over 1 million videos being played on the platform every minute, or 17,000 per second. If you think that Vine only has 1/3 of Instagram‘s active users, this is nothing short of impressive! #Vine users play 1 million videos on the platform every single minute. That’s 17k per second! A surprise here is that Twitter – the second biggest social network generates less social data than dating app, Tinder. Tinder users swipe 290,278 matches per minute – potentially 35 million lovers per hour! Twitter users on the other hand generates 347,222 Tweets each minute – or 21 million Tweets per hour. Snapchat users on the other hand share 284,722 snaps per minute. #Tinder users swipe 35 million potential lovers per hour! Nearly 300k per minute! Video is a huge part of our everyday lives on the internet, and although Facebook is trying really hard to fit in – and is succeeding, with over 3 billion video views per day – YouTube is still the king. Every minute, over 300 hours of new video is uploaded to the platform by its users. On Buzzfeed users view a whopping 34,150 videos per minute! Impressed? Well, you should… and there’s more. Have a look at the infographic below.